Paris, the city of Romance and the City Of Lights - High on everyone's travel list, what better way to get acquainted with it than on a river cruise that takes you down the Seine to see the most famous and iconic attractions in all their glory. Whether you're traveling to Paris for a city break with friends, for a family holiday with little ones, or for a romantic getaway to celebrate a special occasion as a couple you'll find that there's a river cruise just perfect for you. Couples are sure to enjoy the lunch and dinner cruise options, why sit in a restaurant with a static street view when you can enjoy gourmet dining with a view that's always changing as the Eiffel Tower, The Louvre, Notre Dame Cathedral and so many other famous buildings, bridges, and views pass by the window. There are a variety of combo tickets for those who want to do more and see more with their limited time. Enjoy a cruise that's combined with a ride around Paris in a vintage vehicle, make a night of it with a dinner cruise plus cabaret/burlesque show, or make your own city sightseeing itinerary thanks to the hop-on-hop-off river cruise that operates all year long and ferries thousands of passengers along the River Seine over a year. No matter your budget or your personal tastes, we've scoured the booking sites for a river cruise you're sure to be delighted with. 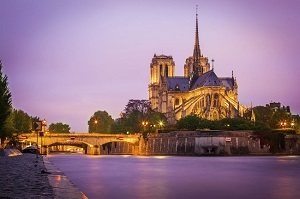 We've done all the hard work for you by comparing the prices, reading the descriptions, and scouring the reviews to handpick some of the best and most interesting Paris river cruises for you. All that's left is to wish you Bon Voyage! A 1 day pass for the River Seine hop-on-hop-off shuttle boat. 8 stops in Paris where you can hop on or hop off. Boats depart every 20-25 minutes. Sightsee Paris at your own pace using the shuttle boat cruise to move around. Enjoy panoramic views from the boat of Paris's iconic landmarks. Stay on board and enjoy a 1.5-2hour leisurely cruise along the Seine. A 1 day / 24 hour pass for the hop-on-hop-off boat. Travel between the Eiffel Tower and Champs-Elysées. Panoramic views of Paris from the water. "It was worth getting. Boats are clean, and staff is friendly." "It's easy to navigate the boat stops and see all the main attractions along the Seine River." "A fantastic was to travel and view the city." A good option for visitors needing to move around the riverside attractions with ease but be aware that the boat has no commentary so it's not so good if you want to learn about the sights you're passing. Great if you want to avoid using the Paris metro and the congested roads. Cannot be used if you have luggage with you - Only use this shuttle for moving between the attractions on a sightseeing day not on a transfer day. An enjoyable family-friendly lunch and sightseeing cruise. A 2 hour cruise on the River Seine passing by some of the most famous Paris monuments. A 3 course a la carte lunch with French cuisine is served. 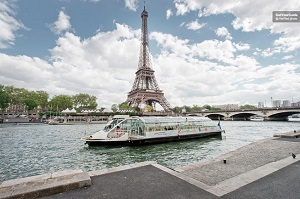 Watch the sights of Paris pass by as you enjoy a 3 course lunch onboard the river boat. Listen to the live music whilst you soak up the atmosphere. Visit the open upper-deck for photo opportunities. 1 bottle of wine and 1 aperitif. 2 hour boat cruise with live music. "A wonderful experience, not to be missed"
" Good food, friendly staff and a nice experience." "A highlight of my trip." 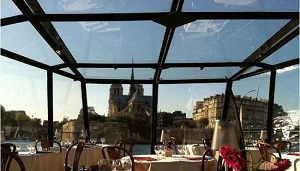 A relaxing way to cruise the River seine whilst enjoying some fine food. A 3 course dinner on the refined Marina de Paris river boat. 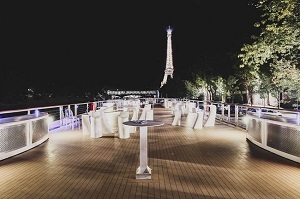 See Paris lit up at night as you cruise down the Seine enjoying your meal. An unforgettable way to spend an evening in Paris. Cruise down the Seine on an evening dinner cruise passing The Eiffel Tower, Pont Neuf, The Louvre and more. Enjoy a 3 course meal of French Cuisine served onboard. Take in the panoramic views from the glass enclosed river boat. Evening sightseeing cruise on the river Seine. "One of the most enjoyable excursions I've had in Paris." "The food was very good, but the atmosphere is what made the cruise. I would do it again in a heartbeat." "The service was awesome, the food, the drink and personnel were great." A romantic way to spend an evening in Paris - Perfect for couples. There's a smart-casual dress code so make sure you pack, or buy, something special to wear! Vegans and vegetarians are also catered for as well as those with food allergies if you notify staff at time of booking. A 2.5 hour river and canal cruise with local guide. A unique view of Paris taking in both iconic grand and quaint neighbourhoods. 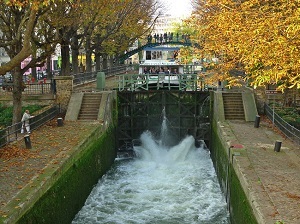 Travel on the River Seine and the Canal Saint Martin. See both the famous side of Paris and the lesser known areas that travellers rarely see. Learn all about the places you're seeing from your English speaking local guide. Pass through tunnels, locks and under bridges. Live commentary in English and French. 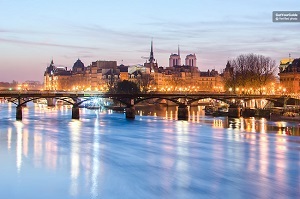 Cruise on the River Seine and on the St Martin Canal. "A great way to see another side of Paris"
"An interesting alternative to the river cruises in Paris." "Well worth the money. Lots of good historical monuments passed and great commentary." Good if you enjoy boat trips and want to see more of Paris than just the popular tourist sites. Not good if you're inpatient and short on time as the boat (obviously) has to travel slowly through the canal lochs. Perfect if you dislike walking but want to see as much of Paris as possible. A 1 hour cruise on the River Seine. See Paris lit up at night with a unique water viewpoint. Learn about Paris from an audio guide or live guide. Sail past the Eiffel Tower, Notre Dame, Louvre Museum and more and admire their facades lit up at night. Learn all about the sights you're passing with live and audio commentary. Enjoy a night to remember. 1 hour cruise on the River Seine. Live guide and/or audio commentary in 13 languages. "A relaxing and different view of beautiful Paris"
"A highlight of our trip!" Breathtaking - Amazing to see Paris lit up at night. A beautiful, and fast, way to experience the best parts of Paris at night. Good for the whole family with kids under 4 travelling free. Great for first-time visitors to the city but also those who have visited before and want to re-experience the beauty of Paris. A 2 hour river cruise with Tapas dinner. Live entertainment and panoramic views can be enjoyed onboard. After the cruise there's a dance party until the early hours of the morning. 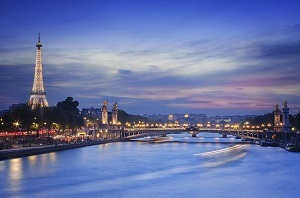 Cruise on the River Seine taking in the picturesque views with the iconic monuments lit up at night. Nibble on some tasty tapas dishes prepared by the onboard chef. Once the cruise returns you can stay onboard and enjoy a dance party. A 2 hour river cruise at night. Tapas platters to try, a mixture of starters, mains, and desserts. Live entertainment during the cruise and a dance party after. Travellers have described this tour as "Super", "Excellent", and "Incredible". They say there is "Fantastic good food and service." One reviewer said "It's spectacular, recommended 100%"
Great for friends, groups, and couples looking to have a good time on the river. A great way to get included in a boat party! An ideal way to celebrate a birthday or another occasion in the city. A 1.5 hour segway tour + boat tour. See the most famous monuments in the City Of Lights. Get a feel of Parisian life on the streets and from the water. Learn all about Paris from your local guide. Join the cruise boat and see the same sights from a different angle. Use of segway and helmet plus high-vis jacket. 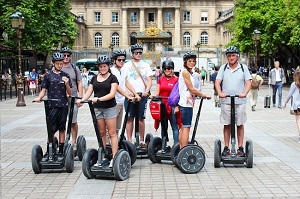 Small group sizes and live-guide for the segway tour. 1 hour River Seine boat tour. "A super fun way to see the city. Had a blast! Would do it again!" "It's a great way to get acquainted with the city. " This turned out to be one of our most favourite activities in Paris. Not recommended for people with back pain, heart problems or any other serious medical conditions. A 1 hour sightseeing cruise with a bistro lunch on the quay. An opportunity to see the sights of Paris from the river. Learn about the sights you're passing with the audio commentary available in 11 languages. After or before the cruise (it's up to you) enjoy a relaxing lunch at the quayside restaurant Bistro Parisian with views of the Eiffel Tower. 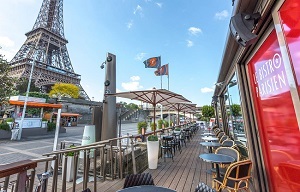 A 3 course self-service Bistro lunch on the quay with views of the Eiffel Tower. A soft drink, beer, or glass of wine with lunch. "The lunch was outstanding and the cruise was Awesome - Worth the money." "Good food and attentive service." "Great value for money. Very relaxed cruise followed by excellent food. " A great way to spend a relaxing afternoon in Paris for first-time visitors. A great way to celebrate a birthday or other special occasion. Good for couples, families, and groups with a special kids set menu also available. See Paris from the streets and from the water. 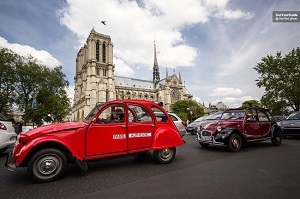 Get a 1 hour tour of Paris from a local in a vintage 2CV vehicle. Followed by a 1 hour sightseeing cruise. Be driven around Paris in a vintage 2CV vehicle with driver/guide. Then hop on the 1 hour sightseeing cruise. From the road and/or the water you'll see the Eiffel Tower, The Louvre, the Arc de Triumph, Champs Elysée, Grand Palais and so much more. A 1 hour tour of Paris in a vintage vehicle with local driver/guide. A 1 hour sightseeing cruise. "We had a great time in Mathilda, a 2CV from 1980, it was all we'd expected and more!" "It was a fantastic way of sightseeing Paris." "The cruise complements the car tour perfectly"
If you enjoy sightseeing but hate walking, this is a tour for you! A must for those who love vintage cars. Good for couples as well as families with young kids - Kids under 12 travel free. A dinner cruise on the river seine followed by a show at the Lido de Paris Cabaret. A fancy romantic evening out with formal dress code. A night of pure Parisian entertainment that will be remembered for a long time to come. Board the Marina de Paris and enjoy a 3 course meal. See the Eiffel Tower, The Louvre, Notre Dame and more lit up at night. Then get transported to the Lido de Paris Cabaret with transport back to your hotel at the end of the evening. 3 course dinner cruise lasting 1.15 hours. Transportation from the boat to the cabaret show and back to your hotel at the end of the evening. Lido de Paris Cabaret show with a glass of champagne. "Scenic dinner and great entertainment"
"Well organized, tasty food, and Lido show absolutely worth seeing." " Was a lovely cruise highly recommended to soak in the Paris atmosphere on the seine for dinner then a fantastic show afterwards at the lido." Great for couples looking for a night to remember in the romantic City of Lights. You must be comfortable with formal wear - Men are required to wear a tie and jacket and women a cocktail dress. A lovely way to celebrate a birthday, anniversary, or other occasion. A hop-on-hop-off river Seine boat cruise. A fun way to move around Paris and take in the sights located on the riverbank. 1 or 2 day unlimited access within operating hours with 8 stops to hop on or off at. Move around the top touristic sites of congested Paris with ease! Admire the sights from the water including the Eiffel Tower. Stay onboard for a 1.5-2hour loop or hop on and hop off as you please through the day. 24 hour or 48 hour ticket. Glass covered boats with panoramic views. 8 stops at, or near, the top touristic sites. A great way to move from A to B around the touristic sites of Paris. The freedom to explore Paris at your own pace and make up your own itinerary throughout the day. There is no commentary provided so this is not recommended for visitors who want to learn about the sights they're passing by. A magical sightseeing tour of Paris by night. Enjoy a coach tour and a boat tour with audio commentary. Also take in the views from the 2nd floor of the Eiffel Tower. Enjoy a romantic cruise along the River Seine passing by Paris's iconic monuments lit in all their glory. Travel along the boulevards by coach as you discover more about the city with audio commentary. 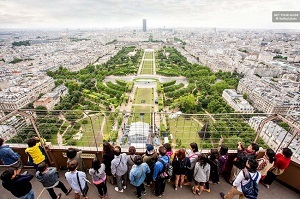 Conclude your trip with a visit to the 2nd floor of the Eiffel Tower for views across the city. Coach tour with audio commentary. Access to the 2nd floor of the Eiffel Tower viewing platform. A superb tour of Paris for a first time visitor who wants to see as much as possible in as short a time as possible. A must if you want to enjoy Paris at night! May not be suitable for young kids due to the length of the tour and the late end time. A great value 2-in-1 combo ticket. Enjoy a 1 hour sightseeing cruise along the river seine. Enjoy fast-track entry to the summit of the Eiffel Tower. Choose a day and time that suits you for the cruise, tickets are valid for 6 months from the time you visit the Eiffel Tower so you don't even need to take the cruise on the same trip. Admire the views across Paris from the 1and 2levels of the Eiffel Tower for as long as you want with access via the elevator. Ask any questions of your English-speaking guide who'll be taking you through an introduction of the Eiffel Tower. Fast-track reserved entry to the 1and 2levels of the Eiffel Tower. Introduction in English by a local guide about the Eiffel Tower. Separate 1 hour River Seine cruise. A must-do if this is your first time to Paris and you want to see the sights plus go up Eiffel Tower. Great for visitors who like to learn about what they're seeing with a live guide at the Eiffel Tower and audio commentary on the boat. A good combo ticket for everyone visiting Paris. A great value 2-in-1 combo sightseeing tour on the road and on the water. 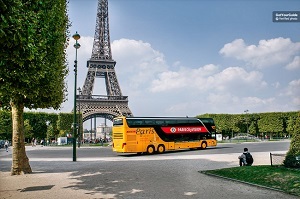 A 2 hour sightseeing bus tour around Paris. Plus, a 1 hour sightseeing cruise on the River Seine. See the sights from a comfortable coach that will take you past The Louvre, Champs-Elysée, The Eiffel Tower and many more places. Then, hop onboard the sightseeing cruise for a 1 hour trip to view Paris from the water. You'll learn about all the places you're passing on both the coach and the boat via audio commentary. 2 hour sightseeing coach tour. 1 hour River Seine sightseeing cruise. Audio commentary via headphones on both tours available in 13-15 languages. A great way for first time visitors to get an overview of the city, especially for those visitors who are short on time. Good for people who dislike walking, or cannot walk far for health reasons. A great option to stay dry and warm whilst seeing the sights if visiting Paris outside of the Summer season.